∠ ~ A nightmare’s closure. Yeo Jin woke up screaming after seeing Do Joon’s figure for one more time and the housemaid rushed to her aid. Yeo Jin’s glass ended on the floor after she drank some water and everything started becoming more clear in the housemaid’s eyes. Yeo Jin asked her where did Do Joon go and she started referring to a party taking place that night. Tae Hyun appears happier and the sister is already aware that Yeo Jin (Sophia) was there last night! However, he’s still worried about Yeo Jin’s health and the sister is confident that he will treat her. Secretary Min heard keyboard sounds from the war room, but one of Yeo Jin’s favorite employees intercepted Yeo Jin’s CT scans without secretary Min suspecting him. The restraining order concerning Tae Hyun arrived in his hands and they made it appear as if she was the one who requested it. He called Chae Young right away and she feigned ignorance while Tae Hyun was informing her that Yeo Jin intended to come back at the 1st Floor Clinic after last night’s meeting. Since he can’t contact Yeo Jin, Tae Hyun wants Chae Young to look into it for him. The board of directors found the whole situation amusing, but Chae Young is concerned about what Tae Hyun may be up to once he finds out what’s going on. Yeo Jin’s employee arrived at the 1st Floor Clinic and he showed the CT scans to Tae Hyun. It’s 2nd stage liver cancer and everything starts pointing towards Yeo Jin’s direction. Tae Hyun called Chae Young on the phone and mentioned that Yeo Jin may be having cancer. He keeps the employee’s presence a secret and he refers to Yeo Jin’s pale face and his personal examination that led him to that assumption. Chae Young will look into it and Tae Hyun wants her to tell Yeo Jin that he will go up to the 13th floor if she’s having a hard time, so she shouldn’t feel forced to come down to the 1st floor. Chae Young arrived at the household and she’s back to her good old self! The moment she tried to drink water from her spy’s disk she was prevented and the housemaid noticed that something’s not right with the water Yeo Jin’s been drinking and she informed Chae Young that Yeo Jin is exhausted due to a cold. Chae Young likes the housemaid’s reflexes and she thinks that she’ll be there for a long time even if the master changes. Chae Young went to meet Yeo Jin in her bedroom and she noticed that she’s started losing her sense of reality. Chae Young witnessing her in that condition thought that she shouldn’t have come to see her and that revenge was supposed to feel good. She left right away and called Tae Hyun on the phone and informed him that Yeo Jin has cancer. He can’t hold back his tears and Chae Young tells him that this must be the reason why she requested the restraining order. Tae Hyun can’t conceive what’s going on since Yeo Jin came to see him last night on her own and Chae Young indicated that she wanted to see him for one last time. Yeo Jin doesn’t have much time left and Chae Young pretends she delivered his message to Yeo Jin who doesn’t intend to go back to the 12th floor. Yeo Jin doesn’t want him to see her like this and just like the 12th floor isn’t an option, the 1st one isn’t one either. Tae Hyun got informed that Yeo Jin wants to stay at home all alone to find some peace of mind and even though Tae Hyun can’t believe it Chae Young reassured him that these were Yeo Jin’s wishes. Secretary Min arrived and he referred to Chae Young as Madame after a long. He’s actually ecstatic when he considers it one of Yeo Jin’s “orders!” Chae Young’s thoughts reveal her real intentions concerning secretary Min, once she becomes his master she’s going to tear him to pieces. However, secretary Min’s thoughts reveal that he doesn’t intend to lose to Chae Young! Tae Hyun can’t help it but think that something’s wrong in the way Chae Young delivered her message, there’s no way Yeo Jin wouldn’t have understood what he meant. Once he recalls Chae Young’s answer everything started making more sense. Secretary Min got informed by the doctor that Yeo Jin has hepatic encephalopathy due to liver failure. At that point the housemaid interrupted their conversation since she wouldn’t like the house personnel to become aware of what’s going on. Secretary Min lowered his voice indeed, but he asked the doctor in a hilarious way how much time is left for Yeo Jin and he burst into laughter! She doesn’t have much time left and since Yeo Jin’s delusional condition will keep deteriorating along with her health the housemaid intends to take her to the East Building. A new form of isolation will begin and a meeting will take place later on in order to create the new will. The housemaid took Yeo Jin to the East Building and the moment she asked for water she broke the glass bottle and urged Yeo Jin to stop drinking it. The not so expressive housemaid let her feelings come to the surface for the first time and she couldn’t stop crying while she was pleading Yeo Jin to come back to her senses. Neither Sang Chul nor Tae Hyun believe Yeo Jin’s orders and Sang Chul can’t help it but think that if that was the case Yeo Jin would have pulled him out. He couldn’t keep it a secret anymore and Sang Chul informed Tae Hyun that he was his bodyguard under Yeo Jin’s command, an order that had nothing to do with Hanshin Group. It’s something only Yeo Jin and the housemaid knows and housemaid Yun received a call from him right away. She talked to him in code since she was well aware that they would overhear their conversation and she asked him if he called her about the ring which is still where it was supposed to be. He should pick it up today before the guests arrive. The fact that she referred to his older brother it could only mean Tae Hyun and he understood that Yeo Jin is in his bedroom inside the East Building. Sang Chul has to take Yeo Jin before the guests arrive and they will have to go through the dog gate Sang Chul cut in secret because he didn’t want the dog to get hurt! Tae Hyun called detective Lee and informed him on everything going on. Sang Chul and Tae Hyun have entered the household! Sang Chul took care of the security guard and Tae Hyun broke the door which leads to Yeo Jin’s new bedroom! Even though she was in aphasia she recognized him and she can’t hold back her tears while hugging him! She knew he would come for her and Tae Hyun tries to calm her down. Chae Young and the board of directors along with the doctor have arrived! Secretary Min said that the forthcoming funeral means a coronation ceremony, but Chae Young reminded him that someone else said that before and he ended up dead! Everyone was happy about everything going on, but Sang Chul appeared and informed them that Yeo Jin will be appearing! And there she is with Tae Hyun by her side and secretary Min called the security right away! Yeo Jin fired secretary Min and Yeo Jin ordered the security to take them out of the house! Detectives Lee and Kim along with the team leader are out of the household and while they were trying to think what to do the doors opened! Detective Lee arrested the board of directors for trespassing, kidnapping, unlawful confinement and attempted murder by poisoning. The commissioner can’t be of any help for now and they don’t need a warrant to arrest them since the owner of the house called them in the first place. ∠ ~ Reality’s cold caress. Yeo Jin collapsed and Sang Chul and Tae Hyun took her to the hospital where Tae Hyun informed the emergency x-ray nurse on Yeo Jin’s condition. Yeo Jin doesn’t want Tae Hyun to leave her side, but he would never intend to do so. Yeo Jin’s in her hospital room and Tae Hyun sleeps at her feet by her side. The moment Yeo Jin woke up and witnessed him she couldn’t help it but caress his hair and face. Chief Surgeon Lee appeared, a moment of awkwardness was succeeded by Chief Surgeon Lee greeting her as the chairwoman, but Yeo Jin ordered him to get out. He informed her that she was exposed to ethionine which causes hallucinations and acute liver cancer which currently progresses towards the 3rd stage. It hasn’t spread to the other organs yet and if they find a liver transplant chances are high she would survive, but the area they operated on her three years ago overlaps with the transplant area. At this point, due to the adhesion, the success rate of the surgery is very low. Since Chief Surgeon Lee performed the surgery on her three years ago it would be for the best of her if he performed this one too. Even after finding out what’s going on Yeo Jin kept on insisting that Chief Surgeon Lee should leave. However, he informed her that nobody else will come if he leaves since he’s the only doctor willing to take care of her. Yeo Jin thinks that the moment for Chief Surgeon Lee to have power over her while being the weak one in front of him has arrived, but he reassured her that it’s just a doctor-patient relationship. Yeo Jin points out that she wants to live a little longer, even if it’s for a short while all she ever wanted was to live a happy life with Tae Hyun while she can’t hold back her tears as she caresses his arm. Yeo Jin acknowledges that she kept hurting Tae Hyun because of her revenge and the chairwoman title she wanted to preserve and she begged Chief Surgeon Lee to help her live for a while in order to make Tae Hyun happy. As a doctor, he promised her that he will do his best. On his way out, the housemaid urged Chief Surgeon Lee to use her own liver since she has the same blood type as Yeo Jin and she’s a good match. Yeo Jin had woken up but soon enough she fell asleep once again and Tae Hyun went to Chief Surgeon Lee’s office where he got informed that finding a liver transplant and removing the adhesion from the Whipple don’t make much sense and that nobody’s willing to perform surgery. Tae Hyun’s willing to do so but Chief Surgeon Lee, who has regained his conscience as a doctor and a human being, tries to tell him that things won’t work out as expected even if they proceed with the surgery. Tae Hyun finds himself in one of his most fragile moments, he can’t hold back his tears and Chief Surgeon Lee informs him on a forthcoming conference where all exemplary doctors will be present. The conference has began and Chief Surgeon Lee refers to Yeo Jin’s case and the signs are positive, but once they witnessed the CT scans their opinions drastically changed and both the specialists and the doctors inside the room left Chief Surgeon Lee and Tae Hyun all alone. Inside Yeo Jin’s room Tae Hyun fell on Chief Surgeon Lee’s feet begging him to operate on her in an attempt to save her life since he’s the one who brought her back from the dead once. With tears in his eyes he asked Chief Surgeon Lee to bring her back once again no matter how hard the circumstances may be. ∠ ~ Fairytales end like fairytales should. Tae Hyun keeps taking care of Yeo Jin who informed him that she doesn’t intend to have a surgery. Even though he tried to hide it, Yeo Jin could read through his face and witness that her condition is a tough one and probably definitive, but Tae Hyun urged her to hang in there and wait for a doctor willing to perform the surgery to appear. Yeo Jin asked him why he didn’t give her the ring he already brought with him and Tae Hyun emphasized on the fact that he intends to give it to her once she’s healthy again; at the Hill of Wind. Yeo Jin asked him to take her there now, but Tae Hyun kept on insisting that this will happen only after the surgery. Yeo Jin considers their presence at the Windy Hill as her last wish and Tae Hyun eventually paced with her flow. Both of them are inside the ambulance which is taking them to the Hill of Wind and Yeo Jin wonders if she’ll be able to make it up there since her condition worsens. Even so, she doesn’t intend to give up since it’s her only wish for now. Tae Hyun piggybacks Yeo Jin to the top of the hill just like back in the days, but under different circumstances! Even now, he tries to brighten her mood by telling her that she’s heavy and once he back-hugged her with love Yeo Jin wondered why they didn’t come there sooner. After a flashback of their renowned kiss up there they sealed their arch vow with a ring, tears in their eyes and another kiss so that they’ll never be apart again! I can never get enough of our beloved couple kissing, they are so majestic together through their simplicity and emotional purity! Cynthia is inside the taxi with someone and they’re heading towards Hanshin Hospital in a hurry! Chief Surgeon Lee was losing himself in thoughts until Cynthia, who was informed on Yeo Jin’s condition by one of the nurses of the 12th floor, arrived! The dude who was with her is her business partner and he’s her own Yong Pal and they came for an illegal house call! Tae Hyun got informed on the latest events and rushed Yeo Jin who was in a bad condition back to the hospital! Tae Hyun got informed on the new Yong Pal’s similar medical background and skills! The operation began and the adhesion was much worser than expected, but Tae Hyun made his decision to progress with the surgery and the new Yong Pal followed his lead. At the same time the housemaid was donating her liver as a transplant for Yeo Jin while Tae Hyun was praying for Yeo Jin to hang in there! This time, Yeo Jin woke up and didn’t find herself in yet another nightmare reality. The dream got as real as it could get the moment Tae Hyun called her name and she opened up her eyes. She greeted Tae Hyun with a bright smile with the name of Yong Pal floating amid her thoughts as the answer to Tae Hyun’s question if she was recognizing him. Yong Pal may not have closed its curtains with another personal record, but 20.4% during its last episode was more than representative of its grandiose course. Having 12 episodes above 18% and with 7 of them surpassing 20% can only prove that this weekday drama was more than successful and it kept reminding it all along the way without fear, but with passion. Yeo Jin’s condition kept deteriorating and from hallucinations and fear she moved towards aphasia and nonsensical references that were related to the past and. The moment she wondered about the party her mind had gotten stuck on Do Joon’s smile during the household celebration three years ago before she left with Sung Hoon; the rest is history. Tae Hyun’s happiness after seeing Yeo Jin was omnipresent and it was carved all over his face, but he never abolished his concerns. He shouldn’t have let her go back to the household, but he would never force her to stay by her side. We all know Tae Hyun’s nature and we also know Yeo Jin’s character, once she has something in mind she has to accomplish it at all costs and taking care of everything before landing on the 1st floor was for the sake of both of them. She was willing to take the risk in her unawareness and Tae Hyun was willing to pace with her flow while keeping his eyes and ears wide open. The restraining order was the first hint proving that something wasn’t flowing well. Tae Hyun had already put his trust in Chae Young and asked her to find out what’s going on. It was the only thing he could do at that point, but the flow of the storyline proved that his arch mistake to trust her would be rewarding in the end. The board of directors found their conversation quite entertaining since they had already thought it was all over and their danger unawareness had passed the thin red line which differentiates a foolish reaction from a safe approach. They were blinded by wealth and power and they eventually neglected that Tae Hyun would never be at ease once his instinct started delivering not so welcome signals. Only Chae Young was able to notice it since she knew how Tae Hyun acts when he has to save someone, especially Yeo Jin. Her decision was to keep him by her side by taking advantage of his trust in order to know each and every step he’d make. Big mistake, because Tae Hyun’s Yong Pal identity knows well his footsteps in the dark, always under the radar. Yeo Jin’s favorite employee played his deus ex machina part well. He recognized that a tremendous change had started taking shape in the background and his hacking skills brought to the surface what was bound to remain a lethal secret until the crime in progress had reached completion. Tae Hyun witnessing the CT scanes and finding out they are from a 31 years old woman everything started gradually pointing towards Yeo Jin’s direction even though he didn’t want to believe it. His indecisive smile was betraying him. The moment the employee told him they are Yeo Jin’s the whole world collapsed for Tae Hyun who had to start restructuring it anew in order to find a way to save Yeo Jin. Once again, Tae Hyun trusted Chae Young and asked her to deliver Yeo Jin a very specific message. At that point she didn’t have to come to the first floor if she was having a hard time, her presence there the previous evening was enough for Tae Hyun to be by her side anew in full force. The 13th floor he left behind once and for all would never be an option for Tae Hyun again, but given the circumstances he was more than willing to get into an elevator that would lead him all the way to the 13th floor to comfort and save her. Chae Young knew how skillful Tae Hyun was in understanding one’s physical condition, she would never be able to keep it a secret from him once Tae Hyun mentioned that his personal assumptions were pointing towards cancer while keeping the employee’s confidentiality. Chae Young felt conflicted after noticing that Yeo Jin had already started losing her sense of reality and witnessing her in this helpless condition. Chae Young didn’t know how revenge felt, it was out of her field. Revenge is supposed to feel good, but it’s a plague that keeps eating a person alive, day by day. It’s a dish best served cold, but it’s not as gentle and guiltless as Chae Young thought it would be. The only revenge she could have ever sought could had been inflicted upon the late chairman for ruining her life in order for her to marry Do Joon. At this point she wasn’t truly loving Do Joon in order to avenge his death, there’s nothing that could justify this sudden desire being forged in the flames of revenge. She was overran by sympathy the moment she witnessed him out of the prosecutor’s office and her guilt for the way she treated him was omnipresent. It wasn’t truly love, it was an ever-expanding sense of sympathy and regret under the veil of an uncertain could-be love vibration. Chae Young mourned her status by Do Joon’s side and that’s what she wanted to regain through her vengeful plans. It was the life she suddenly found herself in, the life she eventually embraced after becoming the chairman’s wife. In a manner of speaking, she’s a different type of Do Joon. Just like Do Joon couldn’t set aside his plans of regaining the throne at the cost of losing his life, that’s exactly why Chae Young couldn’t sit back and watch. She pressured her emotions to make herself believe it was a righteous revenge she had to fulfill while she was dreaming of the throne itself. The exculpation of something evil leads to more evil and eventually the person’s astray in a torrent of negativity. As we had already witnessed, Chae Young was entranced by being inside the household for one more time and she was praising the housemaid’s reflexes and discreet cooperation. Chae Young’s hidden horizon became more visible once she revealed her thoughts of tearing apart secretary Min once she becomes the master. The moment Chae Young called Tae Hyun she delivered all these lies that were supposed to be Yeo Jin’s words and informed him that Yeo Jin has cancer. He could barely hold back his tears and eventually broke apart with Yeo Jin’s sudden change of heart while still believing that Chae Young was telling the truth. He was deceived because he really thought Chae Young had changed all this time. The good thing is that his mind never remains static, it’s a dynamic one that never silences his flow of thoughts. Chae Young talked about the 12th floor while Tae Hyun’s message was referring to the 13th one, it’s something only him and Yeo Jin knew and it was the major crack in Chae Young’s plan. Secretary Min, among others, was forging a new form of isolation for Yeo Jin who was bound to pass away all alone inside the East Building in pain and hallucinations. Even though i laughed hard when he changed his voice under the housemaid’s request he was simply sickening, shameless and remorseless. Nothing more than an ecstatic pile of nothing longing to become something over the ashes of someone else’s empire. All of them were cooperating so that one of them would reach the top of the hierarchy while everyone was craving for that position. Had Yeo Jin passed away it would had turned into a massive power struggle leading to a yet another civilized bloodshed. People like them have no soul like the housemaid already said. She was always preserving her politically correct face in front of everyone. Exploding in tears in front of Yeo Jin was the first time we witnessed her emotional world coming to the surface, something that was proving how greatly her soul was pounding underneath her skin, a soul she had to keep restrained in order to keep being the one she was, the household’s housemaid. The very first days after Yeo Jin returned with Tae Hyun by her side everything was leaning towards the direction that brighter days would dawn inside the household, but Yeo Jin lost herself in the void of revenge. Tae Hyun saving the housemaid’s life while witnessing how caring and loving he was towards Yeo Jin made him want her to be safe and sound by his side since it was the only way for her to blossom. Without Yeo Jin the household and the company would turn into a kingdom of the blind and she would had been forced to maintain her fake loyalty in order to stay alive as an insignificant worker of the new pyramid that didn’t reach completion. The fact that she offered her liver as Yeo Jin’s transplant proved that she was probably one of the rare people truly loyal to Yeo Jin’s father and his bloodline. Sang Chul eventually revealed everything to Tae Hyun and the housemaid played her own part anew. Her cryptic words were revealing so much while still keeping them hidden from those overhearing their conversation. Sang Chul’s “brother” was no other than Tae Hyun and the ring he should get from the place he left it was no other than Yeo Jin in his East Building bedroom. It’s something that should be done before the guests arrived in order for Yeo Jin to make her appearance right on time and ruin the new will at its birth pangs. Tae Hyun breaking the door was depicting his urge to save Yeo Jin, but seeing her on the wheelchair by the window and in constant aphasia must had ruined his heart. The fact that she recognized him amid her blurry thoughts could only bring forth tears of relief for seeing him and finally feeling safe at the same time. Yeo Jin established her reign once again, but not to maintain her throne. All she wanted was to save her life and Tae Hyun who had rushed to her aid while Tae Hyun had already involved detective Lee and the police force with Sang Chul being his right hand and the housemaid the implement progressing a few crucial parts of the overall plan. Tae Hyun appearing in front of everyone while holding Yeo Jin by her arm was proving once again his protective side and love and the fact that he was diagonally staring downwards while Yeo Jin was taking care of everything was because he had faith in her, but he also didn’t want to interfere in her own field. Yeo Jin left everyone speechless, the only who tried to do something was secretary Min; the dog that barks doesn’t bite. His supposed influence had already been ruined the moment Yeo Jin walked down the stairs and delivered her orders as the one and only chairwoman. Detective Lee completed the overall mission by taking everyone with him, connections won’t be able to help them since the weakest parts of the chain who have nothing to lose will crack first, Chae Young’s spy housemaid for example. Just like president Go, Do Joon and almost Yeo Jin, Chae Young fell inside the trap she weaved on her own and the only person who sincerely cared for her, Tae Hyun, will never be by her side again. Chae Young aimed for everything, but she ended up with nothing, just like her partners in crime. Inside the hospital, Tae Hyun would either be by Yeo Jin’s side, something both of them needed, or try to do anything he could to save her. Being together as much as possible was the most desirable aspect in case something went wrong. Sleeping at her feet by her side shows for one more of these countless times his love and affection for her, but also Yeo Jin caressing him while he was asleep was just a glimpse of how much she’d miss him if she had to depart from this world. She wanted to carve in her memories as many images of him as possible and seeing him peaceful while sleeping was probably the best image of him she could keep in her heart at that point since while Tae Hyun was awake she would be able to witness how concerned and devastated he was no matter how hard he was trying to hide it. Yeo Jin’s conversation with Chief Surgeon Lee was insightful, it was the first time she became aware that she had cancer and got informed on its progress, the reasons why and the possible aftermath. She urged Chief Surgeon Lee to leave many times, but he didn’t. He wanted to cleanse himself in front of her by being sincere and preserving his doctor identity to the fullest in front of a person rightfully believing that he wasn’t a doctor anymore. Staying alive for a little longer, that’s all she wanted in order to live a short yet happy life with Tae Hyun whom she kept hurting with her decisions in the recent past. Along with her tears and as the conversation was progressing she gently grabbed Tae Hyun’s arm, there was a high possibility a time would come in the near future that she would be unable to feel him close to her. Intuitively, people reach out for their loved ones when the horizon darkens and Yeo Jin’s horizon at that point was pitch black, but still, all she wanted was a short yet happy life with Tae Hyun despite the ominous signs and the omnipresent sense of loss. Tae Hyun went through so many devastating and heartfelt moments in a row and Chief Surgeon Lee spoke to him as a friend for the first time. Having regained his conscience as a doctor and a human being he tried to convey in the most sincere way that things won’t work out as expected, but still Tae Hyun was holding upon a miracle even though his volcanic tears eventually brought him on his knees begging for Yeo Jin to be saved. Trying to find hope while he deeply knew there was none was shattering him to pieces. Chief Surgeon Lee tried hard not to cry, but Yeo Jin who was seemingly asleep couldn’t hold back that one overburdening tear. Just like his sister needed a liver transplant, that’s what Yeo Jin needed right now if you set aside the difficulty of the operation. The connection is there, but the most important aspect is elsewhere. Even though he doesn’t accuse himself anymore due to incompetence for his mother’s death, he wouldn’t be able to see another loved one passing away in front of his very eyes while not being able to save her due to her condition. Everyone turned their backs on Yeo Jin’s case, both specialists and the hospital personnel of which Yeo Jin is the chairwoman. Nobody wanted a black dot on their prosperous white robes and career, especially when they’re specialists. A seemingly lost case like Yeo Jin would insuperably ruin their reputation and career since Yeo Jin is a part of the privileged 1%. If the specialists stepped back then nobody from the hospital would take the risk and eventually the blame for being unable to save Yeo Jin’s life; career over duty and responsibility. Taking care of her hands with the towel was yet another aspect of his everlasting love. Under the shadow of death, Tae Hyun wanted Yeo Jin to have the surgery at all costs and then take her to the Hill of Wind to seal their love once and for all. However, he would never neglect his loved one’s dying wish. It’s what she wanted and deep within Tae Hyun had already started accepting the fact that their last chapter would be written at the Hill of Wind where everything began, where everything would reach eternity before Yeo Jin’s sunset. Her urge to be there before the end was so strong that even in pain she would never abort her transportation there. The Hill of Wind is the place of their love’s coronation, the open chamber of their love’s throne. The scene was a macabre yet so beautiful at the same time deja vu of the first time they went there and everything was so different. Everything was at its birth pangs back then, now everything is more meaningful but they’re running out of time. Yeo Jin regretted maintaining her chairwoman title and not being there many times before by Tae Hyun’s side. She had missed these “picnics,” but now everything feels way more precious and the past is regrettable under these circumstances. They sealed their arch vow with a ring, tears in their eyes and another kiss so that they’ll never be apart again as their love would always be a part of the unceasing winds. We didn’t only witness Yeo Jin and Tae Hyun shining together through simplicity and emotional purity in a surrounding fairytale environment through the piggyback ride and the back-hug, we also got to see their fragile kiss through so many angles! I am so happy i had the chance to see that sparkling dimple-diamond named Stephanie Lee agai and just like she entranced my life with her presence and interpretation during the first half of the drama, she was the perfect deus ex machina to rotate differently the cogwheels of fate! You know you’re not going to pass away on an operating table when Stephanie Lee is observing the surgery while two Yong Pals and Chief Surgeon Lee are performing it. The moment Tae Hyun asked for the scissors after his emotional hesitations had been soothed everyone followed his lead. The post-surgery ending was minimal and meaningful, what else did we really have to see after their mutual commitment and everlasting vow of love at the Hill of Wind? Witnessing Tae Hyun calling out her name inside the reality both of them were dreaming of and Yeo Jin awakening to greet Tae Hyun/Yong Pal and life anew was the epitome of “and they lived happily ever after.” We didn’t really need to see them happy together to know that their relationship would utterly blossom once and for all and that it would be full of life throughout a myriad of “picnics” to believe it. Tae Hyun and Yeo Jin were complete at that very moment, they had one another and that was more than everything both for them and for me in advance. Personally, i didn’t witness any plot holes, the scenario was pretty concrete for what Yong Pal was, a modern fairytale blooming in the dark. There were a few matters of executive consistency in aspects that don’t apply in real life, but then again, it’s a fairytale, not everything has to abide to reality to make sense. If you accept a few impossible and definitely not supernatural things then Yong Pal is quite perfect for what it is and the meanings it preserves are powerful and essential for one’s humane side. Unconditional love is the source of life and emotional health and Yong Pal depicted it to the fullest by giving life to a magnificent and ever-shining first male lead despite his dark yet humane past and a first female lead with her weaknesses and faults, but also the reasons why, and most and above all her course from the pits of hell to the gates of heaven and backwards to rise anew. The 18th episode possessed brave amounts of feels, they were breathing through each and every scene. All along the way, everyone lived up to any expectations through their acting and Stephanie Lee will always be my midnight sun. However, not only Tae Hyun was beyond perfection, it was Joo Won’s acting that made such a figure endearing beyond repair. If the world was filled with such people it would had been a far better place and dramas is that place for us to escape reality. Tae Hyun kept reminding everything that is precious without having a price and Joo Won was there with his minimal or explosive smiles, his subtle or never-ceasing tears, his concerns, his attempts to make them turn to life and he was rewarded. Joo Won’s masterful approach on a character like Tae Hyun makes me strictly believe that Yong Pal would had been a different drama with someone else on this role and i am more than glad it was him who offered a soulful testimony. The more the drama was progressing the more we were witnessing Yeo Jin’s development as a character. Kim Tae Hee wasn’t a porcelain doll, she was silently delivering the signs of what is yet to come and from a moment and on she exploded with grandeur all over the place. Every emotional shift in Yeo Jin’s internal world was being filtered through Kim Tae Hee’s multifaceted stare and her eyes were vividly depicting everything Yeo Jin was going through. Yeo Jin was a prism through which a different emotional ray was coming out every time, but the most powerful moments were when her conflicting emotions were finding themselves on her very own battlefield. Kim Tae Hee was keeping her gleam in the dark side of the moon and when the timing was right she released it in full force. Talking about chemistry, do i really have to say how irresistibly star-crossed Joo Won and Kim Tae Hee looked on screen as Tae Hyun and Yeo Jin? Chae Jung Ahn and Jo Hyun Jae were exemplary by presenting two broken figures with their own devastating past which had its own impact at the present, but the way they progressed as characters was the echo of their sentient adult actions. They were completing one another and their chemistry was omnipresent both when it comes to one another, but also with everyone else throughout the drama. Jung Woong In is an axiom, he was simply awesome as Chief Surgeon Lee and his ongoing transformations. Song Kyung Cheol as Doo Chul and Yoo Seung Mok as detective Lee were delivering tremendous amounts of laughter, especially Doo Chul who was brightening the horizon when you’d least expect it! Oh Na Ra and Kim Mi Kyung were highly representative as the emergency x-ray nurse and the head nurse respectively. Choi Byung Mo proved for one more time why do secretary and wannabe-director roles suit him so fine! I won’t talk about how entrancing Stephanie Lee was as Cynthia, it’s personal. I don’t always watch dramas to embed more reality in my life and fairytales like Yong Pal are essential once in a while. Yong Pal possessed its own magic and it captivated the minds and hearts of many people in one hand, on the other hand there was lots of negativity towards this drama. Despite being a modern fairytale, Yong Pal had tremendous amounts of reality in how wealth, power and ill-natured ambitions can ruin people, but it was also pointing out how meaningless they are as opposed to the simple joys of life. Yong Pal’s very heart and soul was a utopia in reality’s scarred canvas and the dreamlike aesthetic it reflected against the shades was enchanting. Over at soompi there was speculation on whether Yeo Jin lived or died. I am glad you are firmly in the living camp. I believe that too. Thank you. Yes kwon chingu u r right. Kdramastars confirmed it’s a happy ending. I will stick to my words and continue watching writer-nim’s future works. It’s been an amazing ride watching this show and sharing on your wonderful recaps. Your reviews and thoughts added to the awesomeness of this drama. My days and nights are filled with excitement and anticipation thanks to this show and your hard work. – Can’t help wondering what will happen to the housemaid. Does she have two livers? Thank you so much once again Shuerei chingu! I loved the ending as well and i am on board for a Stephanie Lee spin-off with her own Yong Pal or a Yong Pal season 2! Kim Tae Hee and Joo Won were mesmerizing together! I want to see them together again! Dododododo or nononononot?! XD It’s a cloudy question in a sunny mind! 😀 It was the first time i saw her in a drama and she earned my trust in Yong Pal to the fullest, dunno how she is in other dramas, but her acting was strong in Yong Pal. As per usual insightful and fantastic review. I will miss coming here to read your reviews. I am one that was in the camp of the characters were true to themselves to the end. Again loved the reviews. Kwon, you are the light in the sea of darkness. Your recaps and reviews of Yong Pal are the only ones which do the drama justice. When this drama started, I thought there would be more bloggers covering it. I was surprised to find fewer than expected. Never mind that, those who recapped probably had a hard time. They seemed to have difficulty grappling the drama and understanding it. I can also understand another point of view or agree to disagree. However, it became frustrating when things get interpreted totally wrong. If only, people take time to rewind and read the subs again or listen again to that ambiguous line. Or stop to think a little. Those bloggers whose interest waned and didn’t like the drama, dropped their reviews along the way. In the end, I think there’s only two left. Yours is by far the better one. Why? It’s not that you lavish praise on this drama but you understood, got your facts of the drama right and gave insightful commentaries. The other has let their bias colored their watching to the extent of losing accuracy. Can readers even expect anything insightful to come out of it? Thank you for your hard work in bringing these recaps and sharing with us your views and insights. I wish you well in your exams and certainly look forward to your recaps for my future dramas. I agree with you wholeheartedly MrDimples! 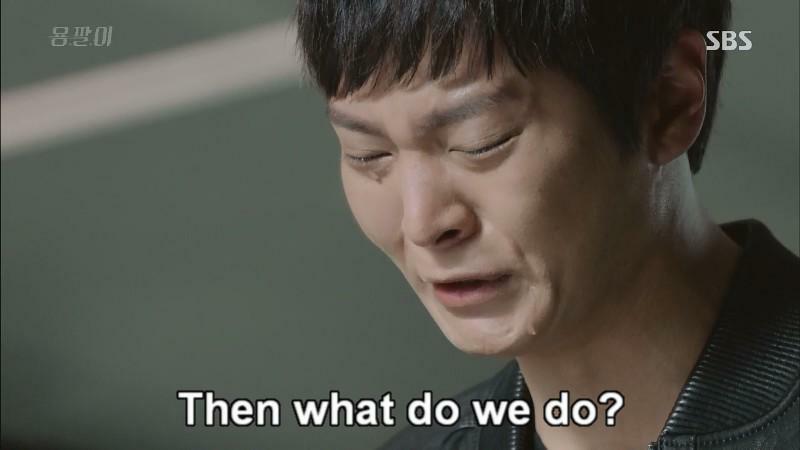 Kwon has done an incredible job on Yong Pal – his reviews and recaps are so illuminating and so profound. I am surprised as you are on the lack of recaps and reviews on Yong Pal. Maybe the upcoming Korean Drama Awards may give due recognition to this drama. Indeed, there are a lot of negative comments about the show on other sites. I wonder whether they misunderstood the show or they just want to disagree for the sake of doing it. Therefore you are right. Kwon’s recaps are like Yong Pal’s nature. Articulate, compassionate and intelligent. I salute Kwon’s recaps and review. Big bow (keunjeol) to Kwon! I was between Ji Sung and Joo Won at the awards, but i was surprised and disheartened none of them got the best actor award. I will always consider Yong Pal a misunderstood drama, just like many people didn’t like last year’s Temptation which was truly beautiful or didn’t appreciate Mr. Back as much as it deserved. Thanks so much for the recap. I think @mrdimples said it all. I know I said it many times but thank you, thank you, and thank you so much Kwon for all your beautiful recaps and reviews! Many people don’t like the ending but I’m really satisfied. It was perfect! I can’t ask for more. I just want my OTP for safe and sound. And they gave it! They gave me Hill of Wind scene again, and it’s so beautiful the way Joo Won and Kim Tae Hee portrayed it. My tears falling endlessly in that scene. (Actually my tears cannot stop when all the angst began lol). All melo parts really killing me softly. But it’s so worth it! Albeit kinda open ending but sometimes I think open endings give and spell out more than just concretely words closure. (And although I won’t mind if SBS give me some snippets or omakes for my OTP, like YWCFS did lol). I’ll definitely watch this show over and over again. This show is definitely becoming one of my fav kdrama all time. This fairytale and movie like story will always be remembered for me. And your insightful and beautiful recaps/ reviews will be accompanied it. And for future reference, I’ll watch your recap and maybe watch those show if I’ve some time. PS: It seems OT but I never mention how delightful seeing your profile picture. Milch Holstein aka Stresemann in Nodame! I loooooove Nodame so much! Both live action and manga itself! One of my fav jdrama of all time too! Yay! Do u prefer joo won in nodame or yongpal? Which drama best display his acting? Nodame? Gaksital? Yongpal? Good Doctor? Or others?